If you bleed Badger red and love all things Wisconsin, your wedding is the perfect place to express your home-state pride. Out-of-town guests will love the local feel, and friends and family will appreciate the nod to the state that raised you. Your wedding day should tell the story of you as a couple, and if you grew up in Wisconsin, spent summers in the Dells, or met your fiancé while attending UW, adding a splash of the Badger State to your day can help your guests experience some of your story. One of the perfect places to incorporate a bit of Wisco-love? Your menu. Pretty much any and every aspect of your wedding-day menu can add Wisconsin flavor, and our state has a lot more to offer than beer and brats. Here are a few ways you can embrace Wisconsinized food on your big day. 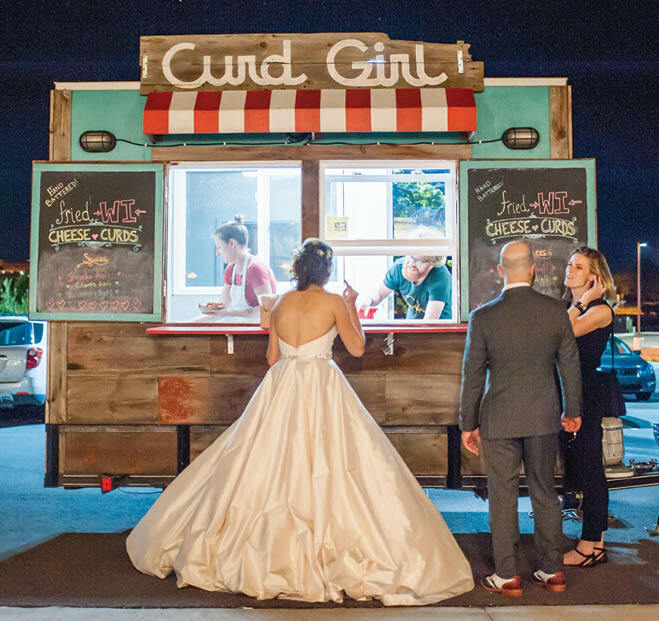 Caterers like Blue Plate Catering specialize in local cheese plates, while food carts like Curd Girl will bring gourmet cheese curds to your appetizer or late-night snack menu. Other Wisconsin-themed appetizers could include mac-and-cheese bites, a cheese and sausage platter, soft pretzels with a beer cheese dip, or brie with cranberries, a Door County staple. Cheese can be a part of your main course as well. Consider serving homestyle macaroni and cheese as a side, made with local Wisconsin dairy products, of course. If you’re dying to work brats into your menu, consider a cheese-and-brat soup as a starter or serve the sausages at the rehearsal dinner. Mini-brats can be served as a late-night snack alongside curds or French fries. Another possibility for Midwestern flavor to embrace the local agriculture and game (as in wildlife). Venison or walleye can be easily incorporated into your main course. For sides, go with some classic Wisconsin potato pancakes or a mashed-potato bar (check out Saz’s Catering for a variety of mashed-potato bar options). When it comes to the bar, you can’t go wrong with the sudsy beverage Wisconsin’s known for. Shannon Triggs, owner of Simply Weddings in Sun Prairie, says that other frequently requested Wisconsin classics are Wollersheim wines and Leinenkugel’s beers. Another traditional drink option? The Wisconsin-style brandy old fashioned, a northern favorite. Let guests decide on sweet or sour flavors for one of the state’s most popular cocktails. VandeBerg and Sarbacker suggest a classic Door County cherry pie or cherry cheesecake as a fun alternative to wedding cake. The duo also have had lots of couples serve a seasonal dessert as part of their menu, then serve cake with coffee as a late-night snack. Door County Bakery and Sweetie Pies are popular bakeries in the region that can supply your pie cravings. Danish kringles, particularly popular in the Racine area, can also make for a tasty dessert option. The pastries (check out the famed ones from 84-year-old Bendtsen’s Bakery) come in a variety of flavors and could be displayed in glass dessert cases to add a sophisticated touch. For extra delectability, mix and match pieces of kringle with some State Fair-style cream puffs. Triggs also suggests ice cream from the locally owned Chocolate Shoppe in Madison. They even have a food truck that will come to you, adding a festive detail. Make sure to introduce your out-of-town guests to Blue Moon ice cream. Whether your wedding is an upscale affair or a backyard bash, incorporating Wisconsin-style food and embracing the local cuisine isn’t hard to do. Your guests will get to know a part of your story—and a particularly delicious one, at that.